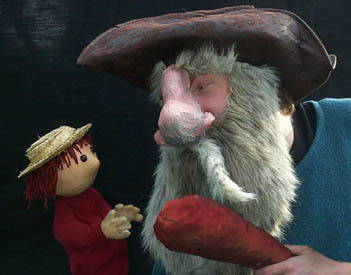 All of our touring shows are one-man productions featuring hand and rod puppetry as well as original music. Our performances last approximatly 45 minutes and include a demonstration and question and answer session following the performance. 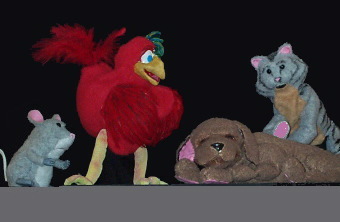 Contact Lionheart Puppets and enjoy one of our many wonderful shows. someone would try to hide them. and make sure that the thief lands in jail. What happens when Harold, a young village boy, discovers a dragon in the mountains? Can Harold convince the villagers that the dragon just wants to be friends? Based on the story by Kenneth Grahame, The Reluctant Dragon is a great way to introduce children to literary adaptations, as well as loyalty and the arts. This show is suitable for ages 4-11. A new tailor promises that he can help the Emperor distinguish which of his knights are foolish and which are noble and true. Will poor Sir Humphrey make the cut? And if he does, can he stop a local thief from stealing the Emperor's riches before it's too late? Based on the story by Hans Christian Anderson, The Emperor's New Clothes shows children that honesty is the best policy. A loyal bird, a two-headed ogre, a wicked giant, seven flies and a jar of jam! It all adds up to a fantastic journey that one young tailor must make to become a royal knight. Based on the story by the Brothers Grimm, and full of adventure and fun, this story teaches children that nothing is impossible if they put their minds to it. This show is suitable for ages 4-11.